Deep in the woods surrounded by trees, lakes, and wildlife you stand at your tower watching for signs of wildfire. What should have been a peaceful few months is interrupted when a dark figure is seen in the distance one night. You call out hoping it’s just a camper but receive nothing in return. 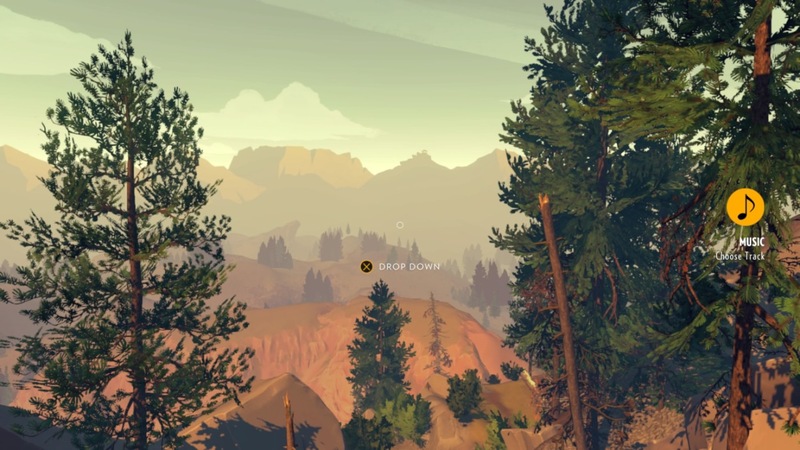 This is the premise of the adventure mystery game Firewatch developed by Campo Santo. The story follows a fire lookout, Henry, at Shoshone National Forest during the summer of 1989. Henry took the job after struggling with the responsibility of looking after his wife, Julia, who had developed early-onset dementia. The intro is honestly one of the most emotionally depressing things I have ever played and it’s an interesting contrast to the rest of the game. I think this ‘shock’ to the system is what fueled my desire to see the rest of the game through and is a great storytelling move. Through the rest of the summer months mysterious and eerie events leave you confounded on what is actually going on at the park and you spend time investigating missing campers, destroyed campsites, and shadowy silhouettes. Exploring the area around your tower you’re able to interact with objects found in the wilderness with some offering history of park, others insight into Henry himself. As the story progresses you find some items to open up new areas such as an axe to clear brush, rope to rappel steep hills and cliffs, and climbing pegs to assist with longer climbs. You eventually stumble upon clues to what is causing the strange occurrences at the park. There is very little interaction with other people, save for the walkie-talkie with which you chat with your supervisor Delilah. You’re usually given a few dialog options which your choices determines your relationship with Delilah and future dialog. Graphically the game is more than serviceable to provide the feeling of being in a national park. Trees, bushes, rocks, and water all look great and the lighting is perfect. Everything has a bit of a cartoony style with bright colours and an almost cell shaded look, reminiscent of Team Fortress 2 but this by no means takes away from the more serious tone that is trying to be conveyed. Even with the style everything feels incredibly detailed. For example seeing something as minute as creases on the cover of a book is a nice touch and shows great care from the art team. Music adds so much feeling to each moment. Tracks while exploring were peaceful and serene, finding clues was paired with pieces that were a little unnerving, and panic would set in while chasing a shadowy figure through the woods at night. The game would not have been nearly as impactful if it wasn’t for the developer’s choices in music. The voice acting was also spot on with each character sounding believable with every line delivered. The dialog between Henry and Delilah was so well done you could hear their relationship evolve throughout the story simply from how they spoke to one another. The most interesting things about this game are the themes. You’re meant to feel alone to deal with your guilt and responsibility, wrestling with balancing those emotions and still doing your job. It’s a rare thing for me to feel for characters in a story but I genuinely wanted Henry and have closure one way or another. This of course is in conflict with the theme of intrigue; there is something not quite right at the park and the answer is out there in the woods. All of this culminates in wondering if Henry might be losing his mind. Maybe this is all made up. Maybe it is part and parcel for his despair and his desperation to try and escape his reality. The game doesn’t offer much in terms of replay value as the story is static save the dialog and relationship options with Delilah. 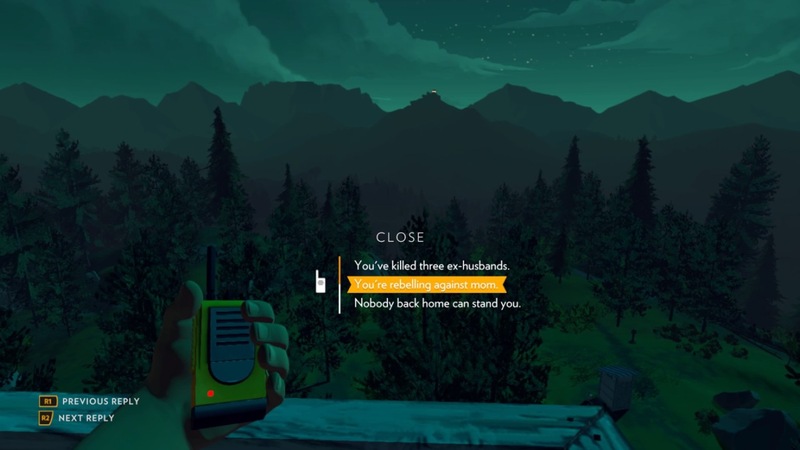 However there is a free roam than can be done once you have completed the main game where you can find cassettes with all the game’s sound tracks and just explore the forest. 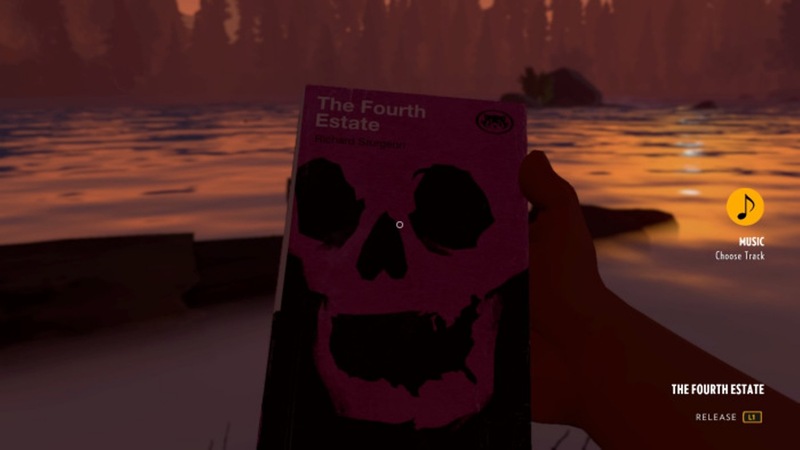 This was a nice touch allowing the player to really interact with the world without a timeline, go for a hike, and just enjoy the well designed vistas. 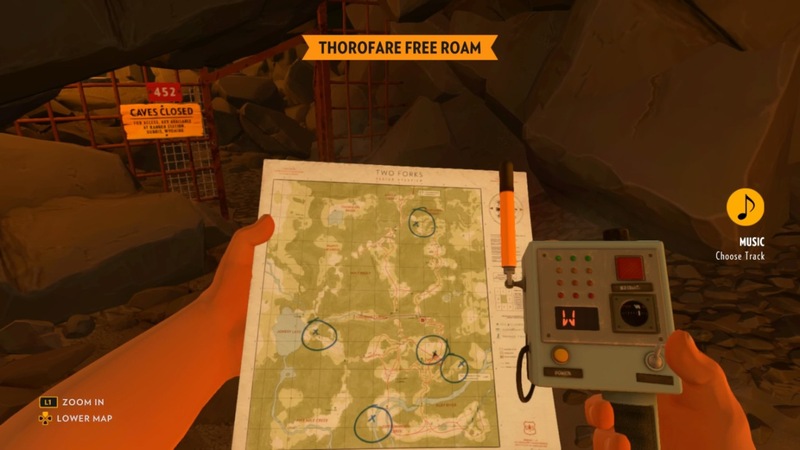 I loved Firewatch but it doesn’t come without a few hiccups. I had a few loading issues when trying to start from a save point which resulted in me having to reboot the game, and although a small issue it still took away from the overall experience. The big one is how the game ended. All the intrigue, all the mystery only to have one of the most anti-climactic endings I’ve ever played; disappointing to say the least. Realistically though the game is still great and worth a play through with its price point. If you like games like Gone Home or other engaging mystery games then this is for you, even if the ending might be a little unsatisfying.